Those who fail in their service to the Queen quickly find that their punishment means hard work rather than time spent lazing in a cell. Beggars and thieves might end up mutilated or even hanged, but an Ambrian with skills – the Queen cannot afford to lose such expertise. The resource pool has become too shallow, stricken with hunger and disease, or lost to acts of banditry and barbarism. No, those who have the potential yet to serve their society can expect to serve in hardship in the very role they might have so earnestly sought to escape. Militia or members of the Watch, for example, who have committed crimes or endangered their companions will find their punishment banishing them to the distant corners of the realm. In the Titans, the threat of raids from barbarians means General Jomilo stations guard units on permanent duty to reclaimed ruins that serve as rude fortifications. 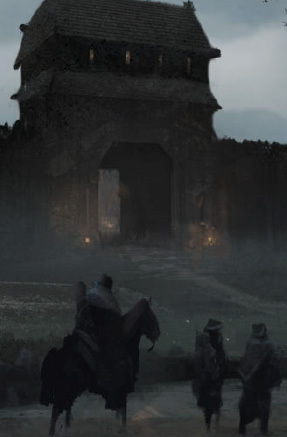 Along the roads crisscrossing Ambria the threat of simple banditry on trade caravans and refugees has necessitated the assignment of common guardsmen to all Guild-favored merchants and temple-sanctioned movements. Compared to a warm fire in a stone tower, trudging through all weathers at the beck and call of arrogant merchants or lice-riddled refugees serves to resolve any sense of rebellion or free-spirit. For the lucky few, the other option sends them north in Narugor, at first to Thistle Hold, but then either east or west along the path that skirts the edge of Davokar. Service along The Sleepless Path either corrects a guard’s temperament or cuts short a troubled life; for certain, no one returns from such duty unchanged or unscathed. I have a convention this coming weekend in Sheffield and have found my creative processes channelled into getting pre-generated character sheets completed for the event. With that in mind, I attach the first pair of six pre-generated members of the Queen’s Watch consigned to punishment duties for their misguided actions.